This creature had one of the best camouflage suits I have seen for some time. The photo was taken at the beach near Negombo. Hope no one stepped on it.. I have to learn, and we have to learn this trick. You have a great eye to even see this crab. It truly is great camouflage. Yes I saw a similar looking thing near Kalpitiya and took a photo. my camera being a standard 10mp digital one, when the photo came out on the computer, all I could make out was sand. There are 100s of them in the beach so it is a task not to trample them :) Usually they are very quick movers so they know how to survive. They live in small holes dug out by them in the sand. Whenever some one comes their way they run to their 'own' hole. Yes, they have a grainy pattern on their bodies just like sand. ha..ha..! 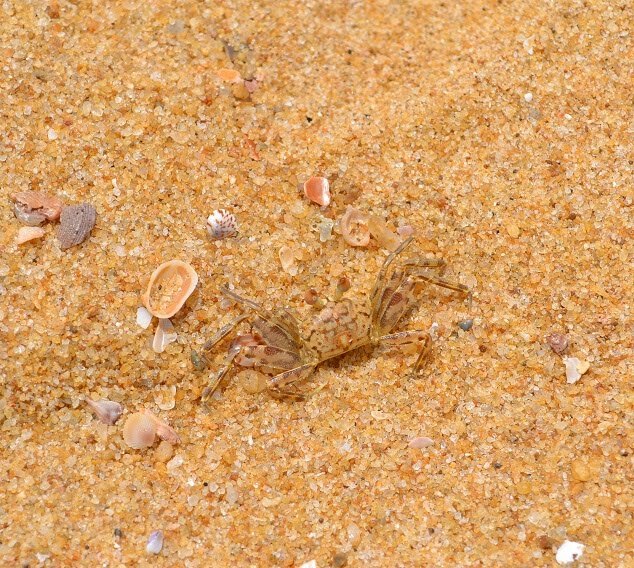 I think you find them all along the beach from Negombo to Kalpitiya. Thanks a lot Betchai and Gallicissa! If you are fond of nice sea breeze and long beaches, this is a great place to explore. Also you will find many more interesting creatures like this one along the beach..
that is a wonderful image of camouflage! Wow!! What a great shot.